Helo! 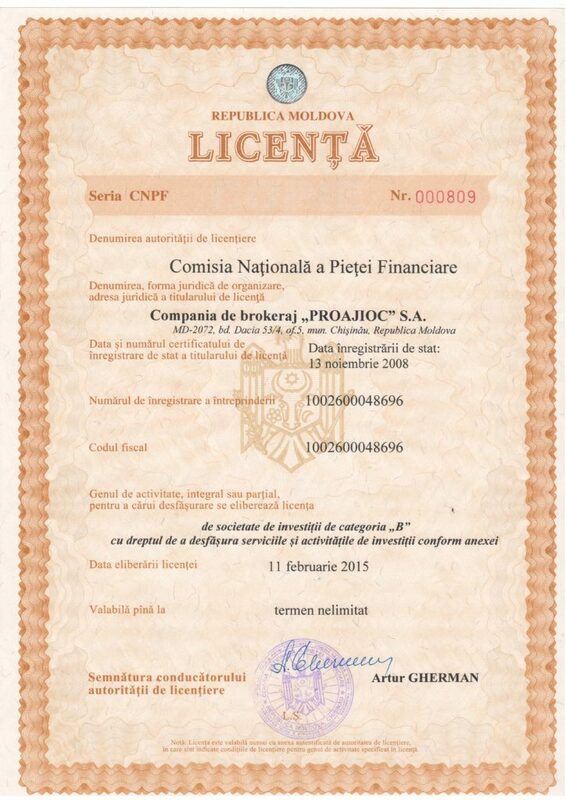 - Brokerage company „PROAJIOC” S.A.
CB «PROAJIOC» SA operates in the stock market since 1998 year. Initially in organizational-legal form – Limited Liability Company (SRL), but due to changes in the law on securities in 2008 year was re-registered as a joint stock company (SA). In February, 2015 received the license of investment company of “B” category with the right of carrying out the investment services and activities in the capital market. Over the entire period of the Society CB «PROAJIOC» SA it was conducted over 8000 securities transactions, more than 500 issuers in amount of more than 1 000 000 000,00 lei. for 2012 year through the mediation of our brokerage company was conducted 503 transactions with 49 issuers in the amount of 201 298 103,13 lei. in 2013 year was carried out 297 transactions with 31 issuers in the amount of 330 1 18 764,30 lei. for 2014 year was carried out 278 transactions with 38 issuers in the amount of 365 448 339,65 lei. 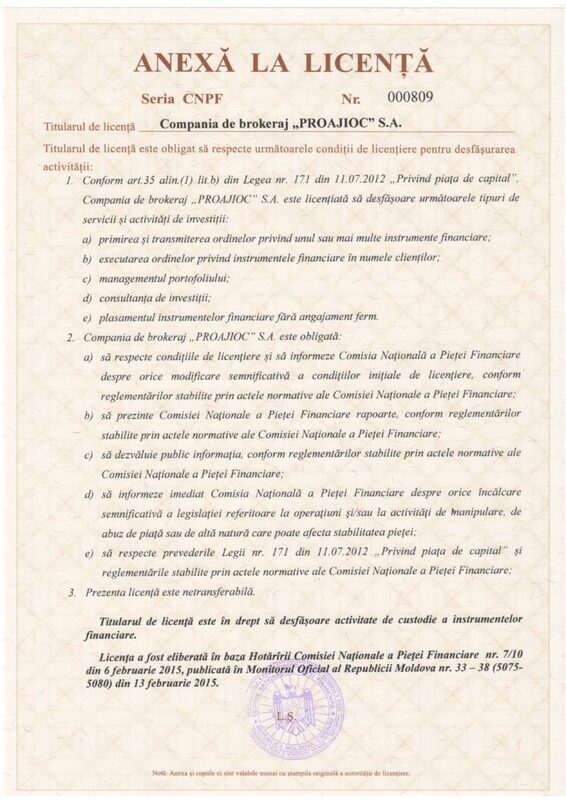 Over the last 10 years, the company «PROAJIOC» SA has repeatedly won the tender for the representation of the interests of the state in conducting of auctions for the sale of shares of enterprises to be privatized (Agency for the management of public property). The basic rules of the Company is – honesty and responsibility in relationships with their customers. Being confident in our experience, qualifications and professional approach, we find the best solutions for our customers.